A bedrock belief among oil forecasters has been that China’s voracious appetite for fossil fuels would stoke global energy demand for decades to come. That assumption now appears increasingly shaky. A highly anticipated new energy-demand projection from Exxon Mobil Corp. XOM 0.31 % released Monday cuts the company’s expectations for China. And a slew of data is emerging that points to the toll a weakened economy has taken on Chinese energy demand, which is among the most important factors in determining the price of crude oil. Exxon cut its forecast for annual energy-demand growth in China by almost a 10th to 2.2% a year through 2025. Over a decade, the revision amounts to more than Brazil’s current annual oil consumption. Exxon also predicts that China’s thirst for energy will peak by 2030. The company played down the change to its figures based on its previously held view that China’s working population is reaching its apex, said Bill Colton, vice president of corporate strategic planning. Oil prices fell 7.4% to $29.80 a barrel after Chinese data released Monday showed that diesel fuel use fell in 2015 from a year earlier. A study issued last week by consultancy ESAI Energy said China’s oil-demand growth rate between now and 2030 would be less than half that of the previous 15-year period. “If demand won’t come from China, who will step in to fill China’s shoes?” said Erica Downs, a senior analyst for the Eurasia Group who focuses on the country’s energy sector. Some energy companies have already taken concrete steps to pivot from oil because China’s economic transformation and global efforts to reduce carbon emissions make its future less certain. Royal Dutch Shell RDS.A 0.29 % PLC, Chevron Corp. CVX -2.25 % and others have pursued multibillion-dollar projects that hinge on natural gas, which emits less carbon than oil and is cheaper or more lucrative to use in power generation. Some analysts believe gas will eventually overtake oil as the world’s most dominant source of fuel. Shell is in the finishing stages of acquiring global gas powerhouse BG Group BRGYY -0.13 % PLC for $50 billion, while Chevron and partners are spending more than $80 billion to build two massive plants in Australia that will liquefy natural gas so it can be shipped overseas to Asia and beyond. But those steps may prove problematic if energy demand doesn’t pick up in emerging economies. Chinese energy consumption rose just 0.9% last year, according to government estimates, as gross domestic product increased 6.9%, the weakest annual rate in a quarter century. The unexpected short-term drop casts a shadow over the prospect of an oil-price rally this year. U.S. and global benchmark crude prices fell below $27 a barrel last week for the first time since 2003. The current oil glut was initially spurred by technology breakthroughs that unlocked more fuel reserves from the ground. But the oversupply is being prolonged and deepened by weaker-than-expected demand. That confluence of factors has made this oil downturn particularly difficult to resolve. If tepid Chinese energy consumption continues, it could raise profound questions about the stability of oil and gas producers around the world, analysts say. Expectations of robust energy demand have always been about more than just China. India, Asian tiger countries and other emerging economies with vast populations eager to move into the middle class were supposed to follow China’s lead economically and on the energy-demand front. Once-prominent fears that the world would soon run out of oil have been upended by plentiful supplies unleashed in recent years. Now emerging concerns about peak demand are starting to percolate. From 2000 to 2010, China’s rapid industrialization created soaring demand for oil to power an economy tied to manufacturing and exports. Over that decade, China accounted for more than 40% of the growth in global demand for crude oil. The seemingly insatiable need caught the market by surprise, helping push oil prices to a record $147 a barrel in 2008. 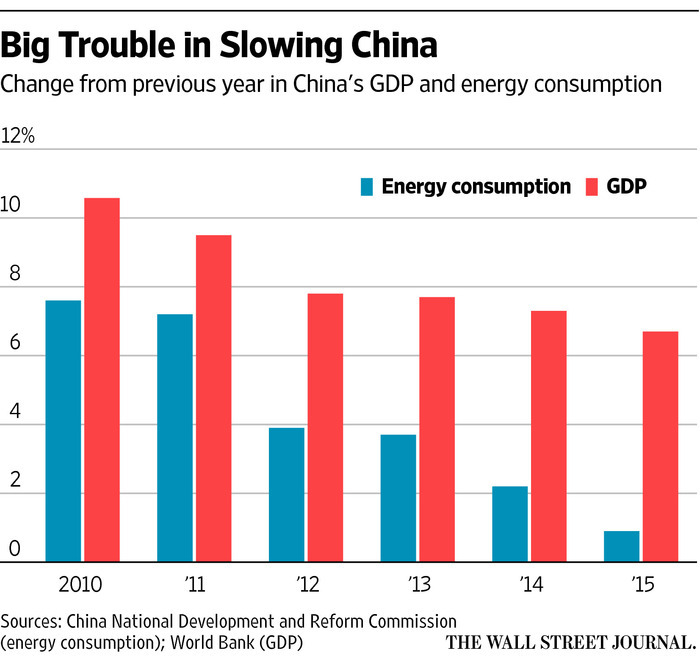 But since 2010, China’s energy demand growth has slowed faster than its GDP. In 2012, for instance, China’s GDP rose at nearly double the rate of energy-consumption growth. Last year, China’s GDP grew six times faster than energy-demand growth, according to figures from China and the World Bank. Some analysts believe the numbers reflect uncertainty around the accuracy of data coming out of China. Yet even accounting for the possibility that GDP data is inflated, the decoupling of economic and energy growth suggests that China’s transformation simply may not require as much fossil fuels as many have predicted. Just as energy companies underestimated Chinese demand in the first decade of this century, they may be overestimating it now, said Anthony Barone, senior vice president for deals and restructuring at Argo, a Chicago-based consulting firm. “Their growth has slowed, and the belief that they are going to be the top country providing stable long-term demand for energy is looking optimistic,” he said. BP BP -0.49 % PLC’s 2015 energy outlook forecast 3.9% energy demand growth for China through 2020, more than four times higher than last year’s actual increase in the country’s consumption. The International Energy Agency’s 2015 energy-growth forecast was nearly double the actual demand figure. Predictions of a tremendous wave of energy growth from China, India and other fast-expanding countries are based on a very real trend. As those economies mature, hundreds of millions of people will enter the middle class and use more energy, driving cars or using air conditioning. That is why Exxon still believes that from 2014 to 2040, global energy demand will grow by 25%, according to the company’s Energy Outlook, released Monday. No doubt middle-class Chinese are using more gasoline and electricity to power their homes and cars, but so far it isn’t enough to make up for stagnating industrial activity. All forecasts that seek to predict the supply and demand of oil or other commodities decades into the future make use of history and emerging trends, as well as informed “guesswork,” said Citigroup C -2.28 % commodities analyst Eric Lee.